This year, the Biological Weapons Convention (BWC) celebrated its 40th birthday in Geneva, at the Palais Nacions. Amidst speeches and backslapping within the coterie of the BWC crowd, the question that hangs in the air is—Are we really any safer? The Biological Weapons Convention was signed by the three depositary countries—Russia, Great Britain and the United States—in 1972 and entered into force in 1975. The announcement by the Nixon administration in 1969 that the US would unilaterally renounce the use of biological weapons and discontinue its biological weapons program provided an impetus towards the establishment of the treaty. Is this a treaty or what? Unlike other disarmament treaties, the BWC has no verification protocol. What this means is that there is no way for the Convention to check to see if those who have signed and ratified the Convention are in fact abiding by its dictates. In 2001, after several years of meetings and consultations, an Ad Hoc Committee presented to the Convention a verification protocol for approval. The US delegation walked out, boycotting the protocol. Due to the refusal of the US to approve the verification mechanisms, the BWC remains a paper tiger. It is, in reality, a treaty in name only, with no way to check on compliance and no way to deal with violations. The US team boycotted the protocol only months before the attacks of September 11 and the subsequent anthrax attacks. Based on what turned out to be false statements that Iraq was hosting an offensive biological weapons program, the US invaded Iraq in 2003. The FBI subsequently allocated responsibility for the anthrax attacks to a Fort Detrick researcher, Dr. Bruce Ivins, who conveniently committed suicide on the eve of his probable arrest. Subsequent reports have cast doubt on the likelihood that Ivins was the culprit. In fact, the weaponized anthrax most likely came from a Battelle lab or from Dugway Proving Ground in Utah. Battelle is a private non-profit which also manages US Department of Energy and Homeland Security labs. Dugway is a military base. Both a Battelle lab in Ohio and Dugway had anthrax from the very same vial that Dr. Ivins had access to at Ft. Detrick and was determined to contain the weaponized anthrax used in the anthrax attacks. In other words, the anthrax most likely came from a facility funded by the US government. The FBI declined to investigate personnel at either of these other facilities. Later assertions, which turned out also to be false, concerning chemical weapons deployment by Syria in August of 2013, prompted the Obama administration to call for war against Syria that year. This was derailed by the diplomatic efforts of Mr. Putin, who arranged for Syria to become a party to the Chemical Weapons Convention. At that point, further accusations began to mount concerning a purported Syrian bioweapons program. Parenthetically, the US had also falsely accused the former Soviet Union of using biological weapons in Afghanistan, Laos and Cambodia. The “yellow rain” controversy, as it came to be known, was eventually resolved and the Soviet Union exonerated of the accusations. According to “The Future of Biological Weapons Revisited,” by Koos van der Bruggen and Barend ter Haar, the lack of a verification protocol is only one issue plaguing the BWC. Other concerns about enforcing compliance remain. The authors also cite concerns that the science going into the production of these sorts of weapons has advanced far beyond the reach of the BWC. In addition, there is a continued and uneasy debate concerning the “dual use” issue. Put plainly, it is necessary to have the biological agent—weapon–at hand in order to produce a countermeasure. This purportedly defensive aspect of bioweapons research opens the door, and opens it widely, to offensive capabilities. Hey Buddy, What’d you do with that vial? Our collective safety depends on a number of factors. The proliferation of labs—there are now over 1350 such research labs in the US alone– has resulted in an increasing incidence of accidents. As reported in a 2014 USA Today article, US labs mishandled dangerous biomaterials at least 1100 times between 2008-2012. These are only the reported numbers. As discussed in Kenneth King’s 2010 book, “Germs Gone Wild,” there have surfaced numerous incidents wherein a lab accident, involving release or illness, was hastily covered up. Richard Ebright, a biosafety expert at Rutgers University, has stated that there are more than four events each week which could be described as a loss or release of bioweapons materials from US labs. Accidents are one concern. Another concern would be events that involve intentional release. The manipulation of false BW assertions by the United States does not end with attempts to invade other countries. Valid questions have arisen as to whether the US is, in fact, engaged in a secret BW program of its own. Information buttressing concerns that the US has, in fact, launched a secret biological weapons program was turned over to the Biological Weapons Convention at the Seventh Review Conference in 2011. This reporter traveled to Geneva in December of 2011 and put this statement on the record. 1) The United States has amended its biological weapons legislation via Section 817 of the US PATRIOT Act and is now giving its own agents immunity from prosecution for violating the law. 2) The United States has failed to report this change in legislation to the BWC, as it is mandated to do in a politically binding agreement. 4) Two separate domestic delivery systems have been delineated—one involving country-wide reconfigurations of water systems, and the other involving impostor pharmaceuticals. Both delivery systems are capable of selective, demographic targeting—either of pre-selected individuals or, by extension, those who comprise a particular group. 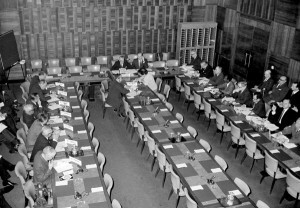 Following the presentation to the Convention at large, this reporter then contacted officials with Disarmament Affairs at the United Nations, in an effort to turn over further supporting documentation substantiating the allegations that the US has developed a covert delivery system, country wide, for a water- borne BW attack. The documentation contained blueprints of water systems, correspondence with multiple government agencies and more. The response by the officials with Disarmament Affairs was similar to that of someone being subjected to a strong electric current: Shock and aversion. So much for protecting the world from state- sponsored biological weapons. In the intervening years since the Seventh Review Conference of the BWC, concerns have increased in many sectors that that the US has launched a secret biological weapons program with intent to deploy. One continuing concern revolves around the evasive behavior by the US in terms of reporting its bioweapons activities. The US is mandated by a politically binding agreement to report changes in its bioweapons legislation to the Convention at large. According to Chris Park, Director of Biological Policy with the State Department and a delegate to the BWC, the US “forgot” to report the changes in the problematic Section 817. That was a fairly big “Oops.” The changes to the US’s biological weapons laws essentially removed the US from compliance with the BWC. The US would therefore have every reason in the world to attempt to obscure this from the Convention members. Concerns that bioweapons may be deployed to specifically devastate pre- selected demographic groups were enhanced in the recent Ebola crisis. Ebola broke out in the areas in which BSLs (biosafety labs) already were in place. There are such labs located in Monrovia, Liberia; Kenema, Sierra Leone; and two in Guinea. These countries were all hit hard with Ebola. Either concurrent accidents or intentional releases could have resulted in the subsequent devastation visited upon these countries by the Ebola virus. Numerous insiders, with the military, government and vaccine companies, have publicly stated the imminent nature of either a bioweapons attack or a pandemic (how would we know the difference unless we were told?). Those making these predictions include former US Senators Talent and Graham, now of the WMD center in Washington, DC; Dr. Daniel Gerstein Department of Homeland Security’s Deputy Under Secretary for Science & Technology; Dr. Robert Kadlec, whose resume includes such high-level positions as Special Assistant To the President and Senior Director/Biodefense Policy, Special Assistant To the President/Homeland Security and Colonel in the USAF; and vaccine manufacturer J. Joseph Kim, to name a few.